If you would like to contribute to the blog simply drop us an email at manxresearch [at] gmail.com and we’ll send you an invitation to contribute. 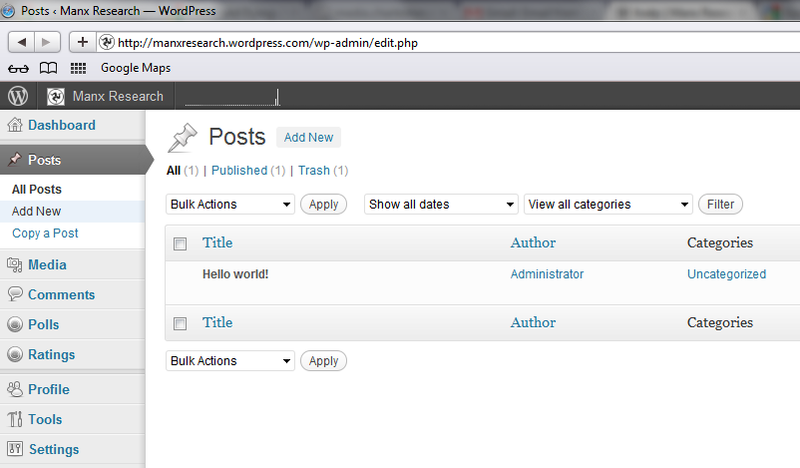 Once you have this login you can submit directly to the blog through the web interface. Alternatively you can email your contribution to us and we’ll add it to the blog for you. Essentially you can write about anything that pertains to your research about the Isle of Man, as long as it meets the policy of acceptable use (see below). The function of the blog is present an outline of your research, this is not the forum for ‘long’ pieces of work, although you may wish to direct others to these works (if they are available elsewhere), or attach more extensive documents to your post, for example a pdf. Remember those readers your post may not understand specialist terms or concepts, so you may wish to define any complex language/terms that you use. At the same time it is worth writing in a style that will be easily digestible for your audience. Manx Research is moderated by volunteers. Submissions will not be accepted if they are deemed to be defamatory, obscene, abusive, threatening, or an invasion of privacy. Derogatory remarks or innuendo towards any individual or group, including those that may be construed as offensive by any individual of a certain race, gender, sexual orientation, or religion, are not acceptable. The moderators reserve the right not to publish content which is believed to contravene any of the above. The decision of the moderators are final. 1. Once you receive an e-mail with your username and password click on the link to go to the Login screen. You can then enter the supplied username and password provided in your invitation e-mail. 2. After logging in, you will be taken to your ‘Dashboard’. 3. If you wish to change your password, you can do so by clicking on the ‘Users > My Profile’ in the left side menu. 4. Add your name to your profile. There is no point in someone else getting the credit for your work. 1. Log in and choose ‘Posts > Add New’ from the left menu. 2. Add your headline in the title box. 3. Then simply then add your text to the test box area. 4. To add links to your post, select the text that you would like to link to another webpage, click the link icon in the toolbar (it looks like a chain) and type/paste the URL of the destination page. Add a title to the link – this will appear when the reader hovers over the link. N.B. 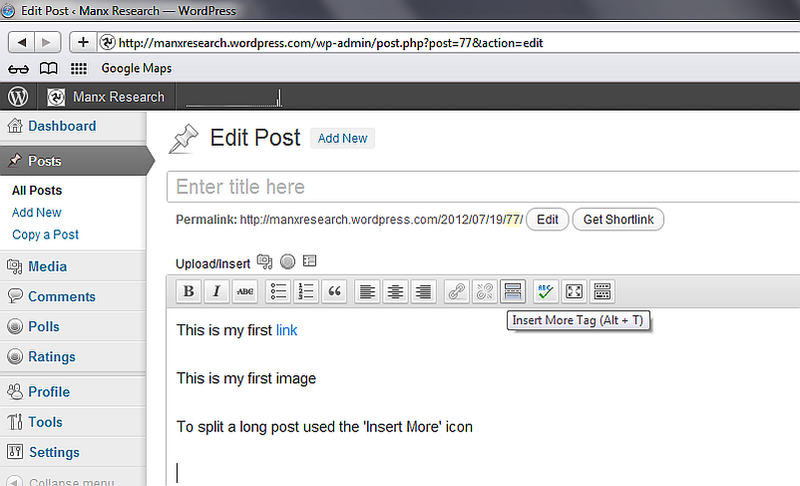 If you would like to add an image to your post see the ‘Image Copyright‘ section below. 6. If you post is especially long you may want to split it, place the cursor at the point in the text where you want the post to be split, then click the ‘Split Post’ icon (this is the one which looks like two rectangles separated by a dashed line). 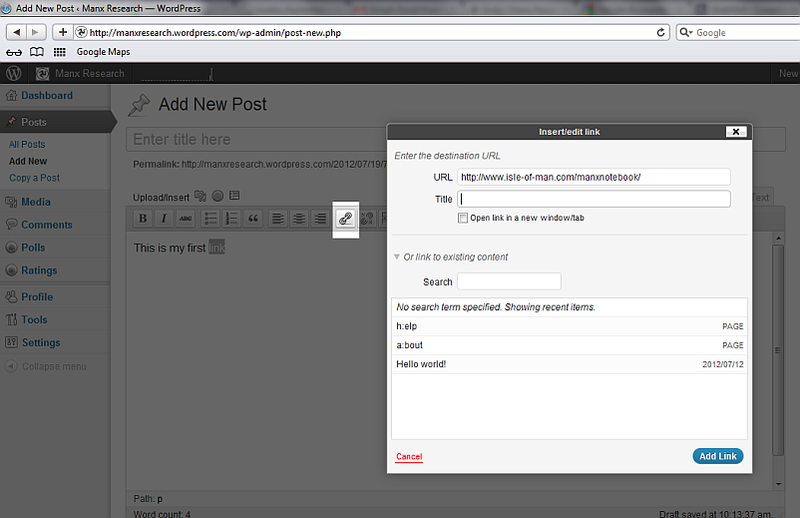 The blog will then automatically create a link for readers to see more after the point you’ve chosen. 6. Using the ‘Publish’ menu on the right, you can ‘Save Draft’ versions of your post, and also ‘Preview’ how the final page will look. You should also choose appropriate categories from the ‘Categories’ menu and add ‘Tags’ (in the right sidebar) this will allow you post to be found more easily by other users. 7. Once you happy with your post click the blue ‘submit for review’ button on the right hand side for the post to be submitted to the moderators for publication on the site. Those in the public domain. These are images that are available for use free of copyright, and often accompanied with a statement saying they are so, a good example are images licensed under Creative Commons. A useful resource is Compfight, an image search engine. You are the copyright holder. Your own photographs. Other peoples image. Used with clear permission. If you find an image on the web, there will be generally be details about copyright ownership somewhere on the page. Please ensure you have permission from the copyright holder before you use an image on your Manx Research blog. Include a copyright statement at the end of the caption for each illustration used in an entry and perhaps a link to the page from which it is derived. Images that do not give clear indication of copyright ownership and permissions will, unfortunately, be removed. For further details on copyright and permissions use the UK Copyright Service website.